Eighteen The end of innocence is a story of Raghu, Aadi, Shalini , and, also you and me. It is because that we can connect with the story in some way or the other, and would remind us of our teenage days. 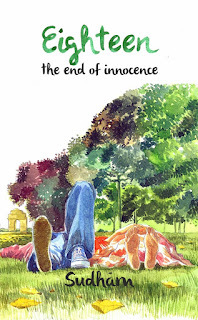 The book started with the protagonist Raghu and his life when he was to take final exams of school. The story moved on with putting up his views, generalities of his life and his friends. It all started with him making a choice for his life about his education, his friends and his girl. The first thing that I liked about this book was that an Indian author had written a novel in a third person style. I have not seen many Indian authors doing that and I prefer reading books this way, so I was on hook from the first page. The story however was a bit slow in the beginning, but you wouldn't come to know that you were gripped with the story with the finish of first quarter.Each chapter started with telling you the glimpse of what must have happened in some words and left you guessing till the end. I liked this way of putting up the story. The characters were drawn beautifully, and my favorite character in the book was Aadi. This portrayal of characters was also one thing that many Indian contemporary authors, who write mushy mushy love stories, don't do. I say this because I picked up this book with same image, but by the end this book had already formed its unique image, and this is not some normal repetitive Indian mushy mushy love story but I would say a unique story in its own way. All the cracks that were opened in the story were sealed appropriately. The story was complete in every sense and that has left me,not happy, but very satisfied with the ending. The editing of the book was also done quite nicely. There were meanings of Hindi words given at the end of each chapter. Even a foreign English novel with German words in between does not put meanings at the end or anywhere in the book. Many small things have been taken care of and all of that has made this an enjoyable read. On the whole I suggest this book to all those who like reading love stories written in a simple language, to all those who want a break from reading scifi or non fiction books, and also to those who only read books when they travel.